Drilling new targets and locating starter pits are the key focus for junior miner Kingston Resources, as it seeks to revive gold mining on Papua New Guinea’s Misima Island. Managing Director Andrew Corbett reveals the company’s plans to Business Advantage PNG. 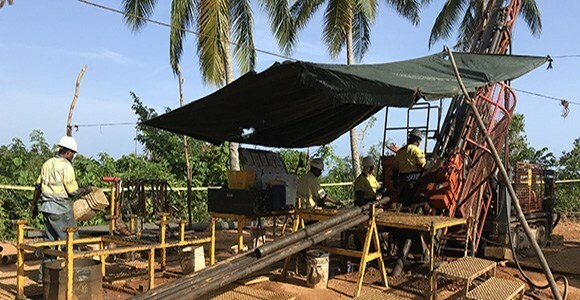 With positive drill results to date, Kingston Resources Managing Director Andrew Corbett is confident further exploration will lead to finding new gold resources on Misima Island in Louisiade Archipelago, Milne Bay Province. The company is ramping up exploration and plans to drill a range of targets across at least four areas within a few kilometres of the original Misima open pit mine, which operated between 1989 and 2004. ‘We aren’t looking to extend the current resource, we are locating new targets in areas with no previous exploration,’ he says. Locating starter pits will be the key to reviving the project, according to Corbett. Kingston’s interest in Misima is driven by the project’s potential to become a large, long-life project, which Corbett says is rare for a junior company. Juniors have great capacity to take risks by developing new and interesting projects that larger, more risk-averse companies don’t pursue, he adds. While confident in the outlook for mining projects in Papua New Guinea, Corbett says access to funding is always a focus. In a bid to lessen its need for external funding, the company’s Livingstone project in Western Australia is seen as a potential funding source for Misima. ‘We are continuing to advance Livingstone, this has always been seen as a great option to help fund Misima, through either cash flow or selling it if needs be,’ he says. Corbett says operating in Papua New Guinea has generally been a positive experience, with great support from the Mineral Resources Authority, other regulatory groups and the local community. ‘One of the most important things for us is the support we’ve received, particularly from the local community. As exploration at Misima continues to advance, Corbett says instability around industry regulations is a worry for the company. As the mining industry in Papua New Guinea continues to strengthen, Corbett says Misima remains a great opportunity for Kingston. ‘I’ve great confidence in mining in Papua New Guinea, with the outlook for gold, copper and nickel in great shape,’ he says. With the Wafi-Golpu project looking set to get the green light this year, and a number of other projects going ahead or looking to expand, Corbett says things are looking good for the sector.